Play music in your Unity 3D games or applications from Midi files. Thank SoundFont for adding hundred sounds of instruments for playing Midi files. Play music from Midi files in your Unity application without any C# or JS scripting. Use customs inspectors to define your musics. Play generated music in your Unity application and reuse hundreds presets and waves extracted from SoundFont. Add Midi Audio Source Prefab in your scene as much as you want. Add Midi files (from the web or from your composition) as much as you want. Play / Paused automatically based on distance. An API is available to integrate MPTK in your application for more complex interactions. Furthermore, all the source code is available! No hidden DLL or binary component. TestMidiFilePlayer: a very simple example with only one MidiFilePlayer prefab to play Midi music. An example of using MPTK to play Midi music without programming. TestMidiFilePlayerMulti: four MidiFilePlayer prefabs are defined on a scene with the camera moving on each to experiment the “Playing on distance” function. 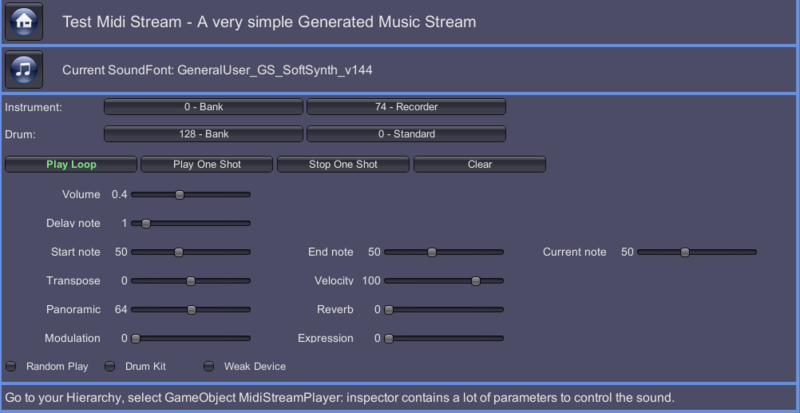 TestMidiStreamSimple: how to generate music without any Midi files with a few lines of code. CatchMusic: Midi is read from a MidiFilePlayer but playing music is delayed in time. Could become a game ! 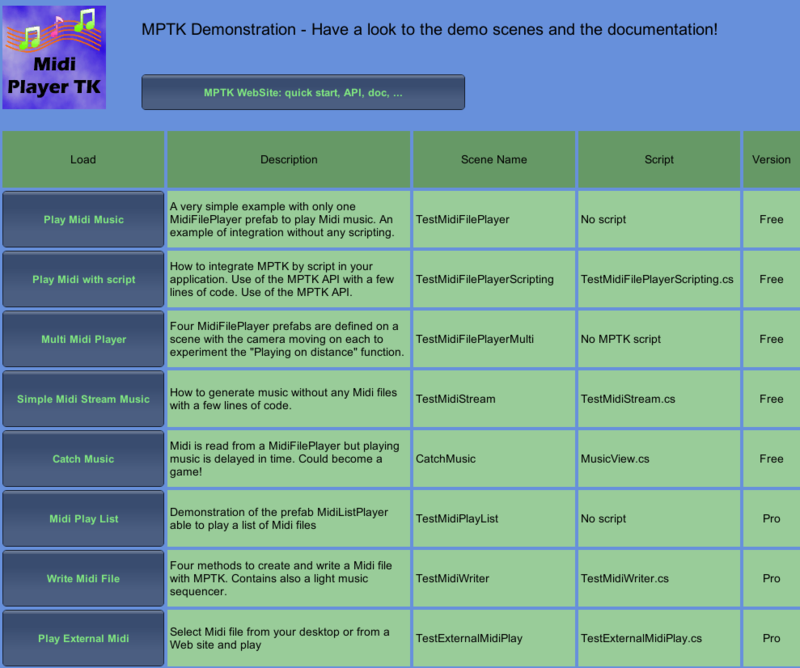 Warning: To avoid interacting with your project, MPTK doesn’t add MPTK scenes in the Build Settings. Add the MPTK scenes with “File/Build Settings” if you want a full functionality of the demonstrator. If you have no need of the Pro function, you can also bought it 😉 It’s a lot of work. Please help keep us sustainable with a professional behaviors even with the free version ! Generate your music from your own algorithm by using hundreds waves extracted from SoundFont. Of course, a pitch effect is added to waves to adapt notes frequency. Some examples are provided to explain how to. Have a look to : TestMidiStreamSimple. For more information see Class MidiPlayerTK.MidiStreamPlayer. 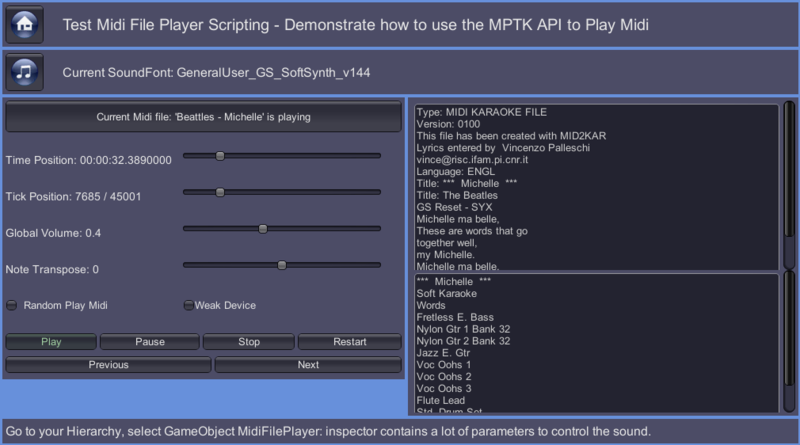 More information about integrating MPTK in your script here.